Pattern darning is a needlework technique that employs running stitch to create a pattern on the surface of the fabric or canvas – it’s basically just working lines of running stitches in such a way that a pattern develops according to the placement of those running stitches. Because it’s running stitch we’re talking about here, pattern darning is pretty simple in concept. The only difficult part of pattern darning is making sure you don’t misplace a stitch, because that can throw your pattern all out of whack. Working on the silk gauze, I had better luck getting my stitches in the right spot when I was using my magnifying lamp. When I didn’t use it, I was more likely to misplace a stitch here and there. And though it might sound boring to work lines and lines of running stitch, it really is a satisfying technique – it’s super fun to watch the pattern develop and grow. When I mentioned playing around with silk gauze, I really meant “playing around” literally. I have an idea of what I want to create, but I can only see if that idea will actually work, if I play around a bit. So the first thing I started doing was playing around with some threads and this silk gauze (which is 48 count silk gauze). I wanted to gauge the size of thread that would work best on this gauze. In fact, the thread I chose isn’t really satisfactory for this type of stitching on silk gauze. It would work well for regular tent stitch on 48 count gauze, but it doesn’t work the way I want it to for pattern darning. Never fear! I’ll try another thread. You know what the Best Part of pattern darning is? Turning the work over, and seeing the negative image of the pattern. I can’t decide which side of the piece I like better – the top, with the darker diamonds, or the underside, with the negative design marked out more delicately. Today, pattern darning is seen more frequently in canvas work (or needlepoint). And working on silk gauze is essential canvas work. But pattern darning can also be worked quite effectively on linen. It’s easier to work on even-weave linen, but it can also be worked on plain weave (non-counted) linen, if worked carefully. It is an interesting way to create a patterned filling on an embroidered piece.
. They’re wonderful patterns and worth taking a look at, if you’re interested in pattern darning. You can also just google “pattern darning” and click “images” to see a whole bunch of neat pattern darning stuff all over the internet! Isn’t it amazing what can be done with running stitch, which is really the simplest of stitches? Hand embroidery doesn’t have to be complex to be beautiful, does it?! Oh Mary! If you keep this up I will never live long enough to do all the methods I want to try! 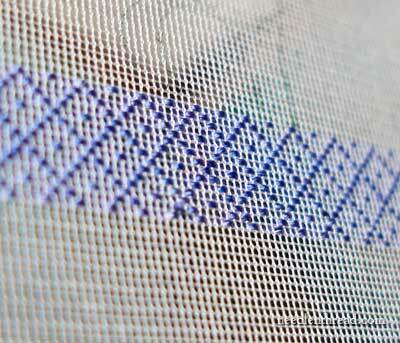 Pattern darning is charming in its simplicity. It bears some similarity to very dense blackwork. Thanks for the links. Hello Mary, I like what you are doing with this running stitch…it reminds a lot of weaving…too bad I gave away all my vintage weaving patterns, it would have been good for reference for darning. It was just under my nose and I never saw the use of it before. OH Well, I will just have to use my own brain. What an excellent idea to use weaving patterns! We have a yarn store in town that is well known for its weaving classes. I know I can grab some pattern books from there. I was so pleased to see that you were writing about pattern darning.What I am particularly interested in is designs for pattern darning that are worked in two direction, creating a third pattern where they cross. 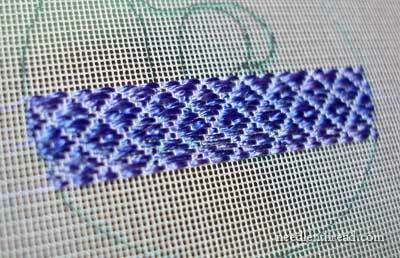 I love samplers and have done a couple with this type of pattern darning, but there aren’t many patterns out there. I guess I’ll have to try and see if I can try to design some myself: that’s a scary thought! This is one of my favorite techniques. Especially like to use Threadworx (Needle Necessities) since the threads are dyed the same in the cut hank for wonderful consistent shading in the piece. For each row use a new strand and start at the same point on the strand as the others. I save the leftovers for a smaller design.